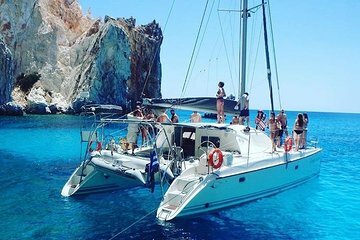 Take a catamaran cruise off the coast of Milos for a day of visiting quiet beaches and admiring the island scenery. You'll see fishing villages and rock formations and go swimming in the clear waters. This was an amazing day. The crew was very attentive, the food was amazing, and the scenery was spectacular. This was our favorite tour of the whole trip! Great crew, amazing clear, turquoise water, and a delicious BBQ in a pirates cave included! They even caught two octopus on our first stop and cooked them up for us at the BBQ. Beautiful scenery and a fun day on the water. The tour was absolutely amazing! Captain Polichronis is very humor, making this sailing so much fun. We had unlimited drinks onboard and also very traditional Greek food which were prepared onboard. Luxurious boat and moved steady! Beautiful and clear blue water make you wonder life is beautiful! This trip was one of the most memorable events on our trip to Greece. We sailed until sunset, stopped to swim and snorkel among caves, were fed a four course meal on a beach, and the captain was delightful. Be warned there were some rough seas along the way, but it was worth it, and that's coming from someone who gets seasick. So glad we did this. This tour was absolutely perfect! We went to several beautiful spots around the island to swim, and each time we stopped they had freshly made snacks and drinks waiting for us when we got back on the boat. Above and beyond my expectations, highly recommended!